Although today it is Europe's busiest passenger port, and mainly offers service industries, Dover has a rich industrial and military heritage. The high white cliffs overlooking the river mouth provided a great defensive advantage for military and naval campaigns from the before the Roman conquest to World War II. Mills are recorded on the Dour in the Domesday book and the combination of water power and easy transportation by sea made rich men of some of Dover's millers. The foundation of breweries and paper mills in Dover can both be attributed to the purity of the chalk filtered water of the Dour. Developing from a cluster of riverside villages to the large town we know today, the river Dour has had a vital part to play in Dover's success throughout the centuries. 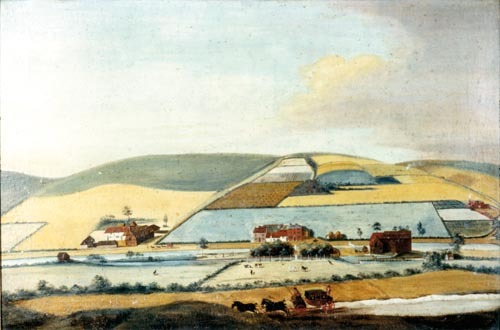 Barton farm (left) and Charlton Mill (right) painted in the 1800s when the upper Dour ran through a series of small villages, soon to be enveloped as Dover expanded upstream. Image courtesy of Dover Museum.